At the March 12, 2014 meeting, Dr. Frank Friedman, president of Piedmont Virginia Community College, discussed its mission, enrollment, curriculum, student outcomes, facilities and funding. The program was moderated by SSV Past President Sue Liberman. Listen to the podcast of his comments. 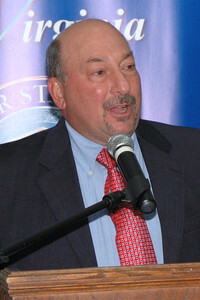 Frank Friedman serves as president of Piedmont Virginia Community College. As president, he provides leadership and management for an institution of 5,500 students, full-time faculty and staff, and a budget of over $24 million. Dr. Friedman has served as a faculty member and an administrator in community colleges since 1977. Prior to becoming president of PVCC in 1999, he served as executive vice president of Austin Community College in Texas. He has experience as a chief academic officer, chief student services officer, director of institutional research and planning, and as a faculty member in psychology and education. Dr. Friedman has a doctorate in educational psychology and a master’s degree in experimental psychology from Purdue University and a bachelor’s degree in psychology from Muhlenberg College. Dr. Friedman has served on national higher education advisory commissions with the American Association of Community Colleges and The College Board. He served six years as a commissioner of the Commission on Colleges of the Southern Association of Colleges and Schools and served three years as the elected Virginia representative to the 13-member Executive Council of the Commission. Among his accomplishments are being named a Phi Beta Kappa scholar, recognition by Who’s Who in American Education and Who’s Who Among America’s Teachers, and receiving the Community Service Award by the Virginia Piedmont Technology Council in 2005. In Charlottesville, Dr. Friedman is on the Board of Directors of the Central Virginia Partnership for Economic Development, the Thomas Jefferson Area United Way, the Jefferson School Foundation and the Entrepreneurial Village, and serves as first vice-president of the Charlottesville Regional Chamber of Commerce. His wife, Sue, is President of the Alzheimer’s Association of Central and Western Virginia. They have one son, Alex, a 2009 graduate of the University of Virginia. The subject of the program presented by Dr. Frank Friedman, president of Piedmont Virginia Community College was, “The Community College: Access and Excellence.” Dr. Friedman began by passing out a 10- question quiz about PVCC to everyone in the audience—but more about that later. Dr. Friedman first provided a context with a brief overview of community colleges in America and then turned his attention to six topics specific to PVCC: mission; enrollment; curriculum; outcomes for student; facilities; and funding. The 23 public community colleges in Virginia all opened between 1966 and 1972. It was a movement in American higher education. Now in America there are 1,100 community colleges with 7.5 million students enrolled in credit courses and another 5 million in noncredit courses. There are 180,000 students enrolled in credit courses in Virginia’s community colleges. There are four parts to PVCC’s mission: (1) access–a post-secondary education should be available to everyone (gender, age, life-long learning, all educational backgrounds, inexpensive as possible; (2) student success—build in numerous supports to engender success; (3) teaching—not a research institution; small classes, faculty teach—typical load is 15 credit hours (five 3-credit course per semester). “If you don’t want to spend your life teaching, don’t take the job here.” (4) community–we are here to support the educational needs of our community and especially to link in with the workforce and economic development needs of our community. For example, PVCC offers a program in viticulture and enology (winemaking) which has enrolled over 400 students; graduates of the program have started 10 wineries and vineyards in the area. PVCC has experienced a very rapid growth with enrollment expanding from 4,100 in 2006 to 5,600 now–much of this fueled by the recession. Seventy-five percent of the students are part-time. Only 500 students come directly from high school; 80 percent work; 40 percent are over the age of 25; 1,200 are still in high school in a dual-enrollment program earning college credits at no cost; 50 percent receive financial aid—and when there is talk about cutting back on Pell Grants, just remember that they are the single largest source of financial aid for PVCC students. Half of the students use PVCC as a steppingstone to a bachelors degree through a transfer program with guaranteed admission as a junior to UVa, Virginia Tech, William and Mary and many other universities and they save $25,000 along the way.